“Never in the field of human conflict has so much been owed by so many to so few”. These famous words were spoken by Winston Churchill in a speech to the house of commons on August 20, 1940. He was referring to the courage and sacrifice of British pilots fighting against the German Luftwaffe in the Battle of Britain. The Germans were constantly bombing Great Britain in preparation for an invasion. 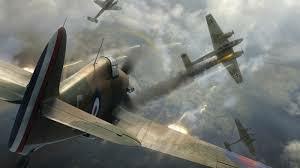 It was through the bravery of the British pilots that superiority was finally gained in the air, the tide of the war began to turn, and England was saved from almost certain defeat. In the courage and bravery of the British pilots we see an example that helps us understand what Paul means when he calls on believers in Ephesians 6 to “Be strong in the Lord…”. Paul helps us understand the struggles of the Christian life by describing them in terms of warfare. In studying this passage, we find how to have joy, assurance, and victory even in the challenging days of the legislative session. Churchill is said to have first uttered his stirring words after a particularly brutal day of battle. He was so moved by the courage and sacrifice of the British pilots that he exclaimed, “Never in the history of mankind has so much been owed by so many to so few”. He was to later immortalize those stirring words in his famous speech. As he prepared and practiced the speech, an advisor asked him, “What about Jesus?” And so, he changed the words to “Never in the field of human conflict has so much been owed by so many to so few”. This should challenge us to remember the great battle which Jesus fought on our behalf. He endured conflicts against Satan and temptation for us. He fought our battle against sin and death. Now, as we are called to fight, He comes alongside us to strengthen and encourage us in battle. This is the truth that will bring us assurance and victory, not matter how great the battles we face! This is the focus of our Bible studies this week at the capitol. (Link to this week's notes.) We are in week three of the legislative session and we continue to minister to, challenge, and serve all those at the statehouse during these hectic days. We are holding two studies each Thursday and visit each office distributing our study notes and seeking to serve and minister any way possible. Last week I had the privilege of attending the G3 Conference in Atlanta to represent our ministry. I hated being away during the session, but a long-time participant in our ministry led the studies and things went well. At G3 we made contacts with some several who may be candidates to lead ministries in new states. Please continue to pray for us and for the legislators, leaders, lobbyists, and staff as the regular session gets busier and more challenging as days go by. Pray that many might come to know Christ, the One who fought their greatest battle for them. Pray that believers might understand how to find joy, assurance, and victory in the spiritual battles in the capitol and in their lives. Pray for God to lead us to those who might be ministry leaders in other states. Be sure to visit your state page at Pray1Tim2, a great tool to help you pray more effectively for your leaders.